The Michael Bell-trained Big Orange showed that he had a big heart to go with his big frame, as he landed a thrilling renewal of the G1 Gold Cup under James Doyle. The well-backed 5/1 shot was second early on in the two and a half-mile contest behind Quest For More, but after being taken to the front by Doyle, registering his eighth victory at the Royal Meeting and second of the week, he was not for passing, as he gamely held off the challenge of last year's winner Order Of St George (5/6 favourite), trained by Aidan O'Brien, by a short-head. Doyle, who landed the ride following Frankie Dettori's injury which ruled him out of the Royal Meeting, said: "Frankie just told me not to interfere with Big Orange. We were a little bit concerned that Roger Charlton's horse [Quest For More] was going to go on and he led us for a couple of furlongs, but I thought I shouldn't be doing this as I'm interfering with him, so I pulled him out and he pricked his ears nicely. He knows what speed he wants to go at and you just sit as a passenger. I had Frankie's voice in my head, so just eased him, let him go to the front and the rest was history. "Big Orange got a little bit lonely and I wished that something had just joined him a bit sooner and he would have won a bit more impressively. It is a long time to be in front when you make the running like that and he had plenty of time to get lonely, so I couldn't knock him for that. "I wasn't sure if Order Of St George was just lugging into him a little bit, but it just gave him a little wake-up call and I always knew he was going to hold him to the line. I knew he had won crossing the line, but when I saw it was a photo, I thought, I hope I haven't gone too soon! I only knew I was going to be on this horse a couple of mornings ago and he is the people's horse - it was just a pleasure to ride him." Doyle, when asked to describe the qualities the six-year-old son of Duke Of Marmalade possesses, he responded: "He is a real proper old-fashioned stayer who just wears his heart on his sleeve and just tries. I wish most horses I rode tried as hard as him. He feels like a bit old-fashioned sort of jump horse. "He is so long to sit on. I don't want to knock him by saying that, but he is big, long and great to ride. You can really sit into him and chase him along, he is just a real battle-hardened champion. "He is as tough as they get. Full credit to everyone. I can't really take anything out of this and it was great to get the call up - unfortunately, Frankie couldn't have got an injury at a worse time. He's a real star - he phoned me a couple of nights ago and he was telling me all about the horse. He was exactly spot on. I can't do it without the help of everyone. "Watching back Yeats and all those replays, it is a very prestigious race. I didn't even know I was sitting on this lad until the other morning, so I was delighted when I got the chance. Frankie said that he would have a big chance and Jamie Spencer helped me a lot." Winning owner Bill Gredley said: "He has been working well and is thriving. All credit must go to Michael Bell. He has done a fantastic job on him. His head lad Tyrone has looked after him and Michael's staff deserve a lot of credit. They are really good guys who have done a lot of work on him. "We are here to take the applause but there are people behind-the-scenes who deserve to take the applause. "He [James Doyle] rode like we wanted him to. We knew Quest For More would come up alongside to lead and we said that if he is not going fast enough, then make your own pace and be in your comfort zone, which he was the whole way round. "That is just how he is. Frankie gave James some good advice but he is not a horse who seems that bothered now. He just gets on with everything. It is always nice to win and when you think he has gone that pace over two and a half-miles up front, that takes a lot of getting but he is very difficult to get past. "This is alongside User Friendly's [Epsom Oaks, Irish Oaks, Yorkshire Oaks and St Leger winner] victories I suppose. She was a good horse and let's hope they keep coming!" Order Of St George, sent off the 5/6 favourite and bidding to win the Gold Cup for two years in succession, was just denied his goal by Big Orange's brave front-running performance. The Aidan O'Brien runner had to chase down the leader in the home straight and pulled out every effort under a strong Ryan Moore ride, but on the line the verdict went the way of Michael Bell's horse by a short head. 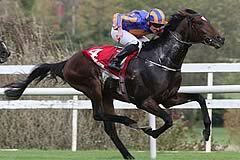 "He ran a very good race," said O'Brien of the five-year-old by Galileo. "I am not sure yet where he will go next, we'll see how he is." Order Of St George has run 18 times, won eight races, finished second six times, third once and fourth twice. Laura Mongan's burgeoning career was furthered enhanced by her stable star Harbour Law's third place in the G1 Gold Cup. 33/1 chance Harbour Law, who took the Ladbrokes St Leger on good ground last year, easily ran up to his mark on good to firm ground to finish a short-head and six lengths behind Big Orange and Order Of St George. An elated Mongan said: "I threw my hat off! "He ran a cracking race. We knew he was entitled to be here. He didn't have a great start to the year but has come here 100% and he is a very nice horse - there is a lot more to come from him. "I don't know whether we will go to Goodwood or not, we will have a chat with Jim [Crowley] and the owners and see what works out. "You can see that he has had a run. The ground wasn't really his and it was far enough for him. "The right two horses were in front of us. He has done us proud. "I am happy with this and will enjoy it for now." 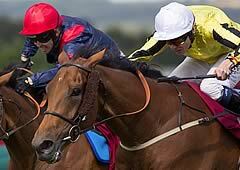 The Lawman colt's jockey Jim Crowley, added: "He has run a good race, he has run as well as I thought he would. If this was soft ground it would be a different story."